Over the next decade, football had become so popular that it was included in the 1900 and 1904 summer Olympic games but these were contested by various clubs and scratch teams. Although the IOC considers the 1900 and 1904 tournaments to be official Olympic events, they are not recognised by FIFA. The 1908 games held in London saw the first time a proper international tournament was organised by FIFA and the IOC. 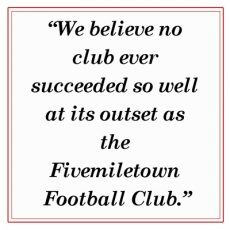 The decade started with plenty of praise for the Fivemiletown Football Club with several reports in the local papers reporting on how successful Fivemiletown has become, well able to take on and beat any team in the surrounding areas, this decade also seen the start of competition football with two tournaments being organised, Clogher Valley Cup and the Mercer Cup run by the new Fermanagh and South Tyrone league. But this success didn’t last for too many years.